10.00-10.30: Krzysztof Tarkowski: Who Are You, Professor Hacking? 14.30-15.00: Tina Wachter: Can Conventionalism Save the Identity of Indiscernibles? 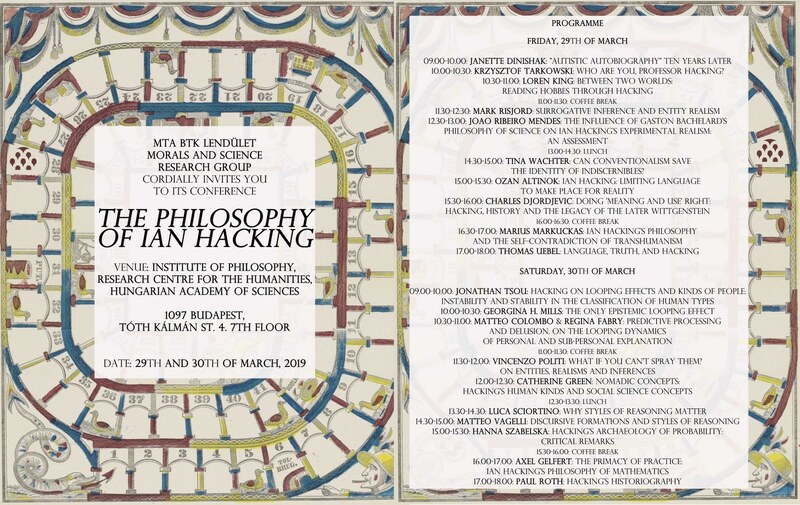 Venue: Institute of Philosophy, RCH HAS, 4 Tóth Kálmán str., 1097 Budapest, 7th floor, room "Trapéz"
Balázs Gyenis is giving a talk at the Johannes Kepler University of Linz on the 14th of March titled "Slowing clocks, shrinking rods, and curved spacetimes". For more details see link. New volume edited by Ádám Tamás Tuboly and Jordi Cat (Indiana University, Bloomington) appears with title "Neurath Reconsidered: New Sources and Perspectives" (Boston Studies in the Philosophy and History of Science, Dordrecht: Springer, 2019). The 706 pages book contains 18 new studies by internationally acknowledged scholars, as well as yet unpublished papers and scientific correspondence by Neurath.